And opens into a tablet mode. There are two displays on Samsung's phone. One static phone-style display on the outside, and athe folding display on the inside. Today is the start of the Samsung Developer Conference 2018, and to hype the event, Samsung revealed a bit about its upcoming smartphone with a foldable display. After a lot of talk about Bixby and Samsung's Android Pie update, the company cut the lights and showed off a folding smartphone veiled in darkness and hidden in a case. It wasn't a full device announcement, but we're still able to glean some information from Samsung's tease. Samsung is calling this hardware the "Infinity Flex Display," and it will come as part of the company's first foldable smartphone. As you would expect from Samsung, the display is still OLED. The cover is no longer glass, of course, because glass isn't flexible. Samsung says it developed "an advanced composite polymer"—plastic—to cover the display instead. That plus a new flexible adhesive that bonds the display cover together allows the display to be folded "hundreds of thousands of times" without degrading, according to Samsung. The company even said it was developing "rollable" and "stretchable" displays for the future. For this presentation, Samsung said it had "disguised the elements of the design" with a case, but you could still clearly see how the display was laid out and how it worked, even in the dark. The layout of the phone looks a lot like the foldable phone concept video Samsung produced all the way back in 2014. The device opens and closes like a book, and there are actually two screens. When closed, you'll see a rigid, smartphone-style screen on the front of the device. Opening the "book" will reveal a second, much larger bendable screen on the inside of the device. It's not clear just how much of the phone was obscured by a case, but the outline shown would be a huge departure from current slim-bezel smartphone designs. When closed, the front display looks very small compared to the body of the phone, with a maybe a full 25 percent of the top of the device left as blank space. Since we could only really see the display and the outline of the body, we're not sure where exactly things like a camera lens would live. Enlarge / Left: Samsung's inside-display 2014 concept. Right: Royole's outside-display device. Which design is better? With Samsung's new device and the other foldable smartphone that was recently announced (the Royole FlexPai smartphone) we're seeing two competing designs in foldable smartphones. In contrast to Samsung, Royole's design uses a single display. If we go back to the book metaphor, Royole's design wraps a screen around the entire front and back cover of the book. When closed, you see half of the display, and when opened, the front and back book cover form a single, large display. You never look at the inside of the book, since that has no displays and is always blank. Samsung's two-display setup, with the folding screen inside of the book, seems a lot harder to pull off. Durability is a big concern for these folding display, and Royole's outside-display design seemingly helps with this thanks to a more gentle display bend when closed. Samsung's inside-display design means putting a harder crease in the display, and therefore more stress. Both designs seem concerned with how dramatic of a fold is put into the display. The FlexPai, despite the outside-display design and gentler bend, still doesn't come close to folding entirely flat, which puts even less stress on the display. Samsung seems to be doing much, much better in this area with the inside-display design, but it still doesn't fold flat. Outline drawings of Samsung's phone shows a gap in the phone when closed, so it doesn't fully crease the display. Having a device that can close into a "phone mode" or open into "tablet mode" sounds pretty compelling. When closed, the device should be easily pocketable and usable for quickly checking notifications. The opened tablet mode is always there, ready for more serious usage, like gaming, reading, or viewing photos or videos. Samsung even promised to go a step beyond the current Android multi-tasking implementation and allow you to open three apps at once in tablet mode. Besides the usual side-by-side split screen, you'll be able to split the layout again, resulting in two smaller apps stacked on top of each other next to one bigger app. Samsung is the world's leading display manufacturer, so if anyone nails down the flexible display future, it will probably be them. Samsung says it would be ready to "start mass production in the coming months" while Google—which worked closely with Samsung on the device—said it was launching "early next year." Google is doing its part to support Android's foldable phone future, too. At Google's Android Dev Summit, which is also happening today, the company announced a new feature in Android called "Screen continuity." This will allow you to start an app in one display mode, open or close the screen to mode into another display mode—everything will just adjust itself to the new screen size. Android's VP of Engineering, Dave Burke, described the feature saying "as you unfold, the app seamlessly transfer to the bigger screen, without missing a beat." How well apps support this will be on an app-by-app basis. 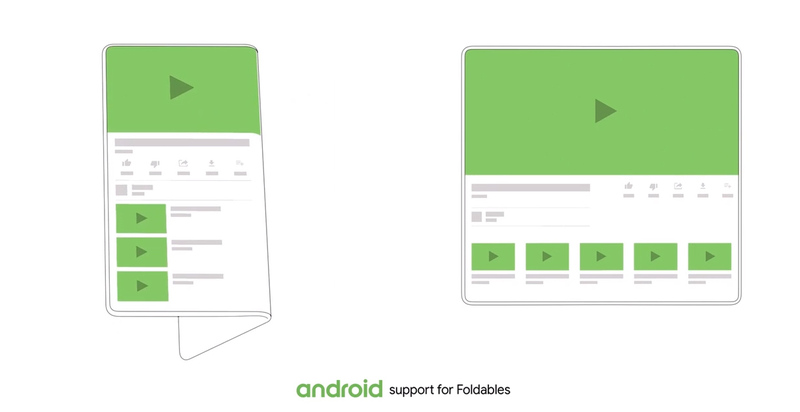 Burke says Google wants to add support for foldable screens in a way that requires "as little work as possible" from developers, but they will still need to have an app built with a modern core and need to add new "resizable" flags to their app. Many Android apps today are absolutely terrible when it comes to screen resizing, which you can see anytime you rotate the phone. For instance, search for something in Google Keep, then rotate the phone—you'll lose your search results and get a broken, blank search screen. Rotating the phone will often just delete whatever you have in an open text field. This happens in the Twitter app, which will just delete your currently-entered search if the app rotates. Other misbehavior is more complex. If you rotate on the Gmail compose screen, it will hit "enter" on whatever text you are currently typing, and then change text fields and jump to the "To" field, presumably because it's the first text box on the screen. Other apps will inexplicably close the keyboard. This is a lot better than it used to be, where some apps would just close and restart on a screen rotation, but Android has a lot of work to do when it comes to seamlessly transitioning between screen states. It's not clear if Google is building new APIs for Screen Continuity or adding new APIs to Android to make this happen. Google says it will reveal more about screen continuity in a talk tomorrow.